When my husband and I met in 1998, he was reading a book called OUTLANDER by Diana Gabaldon. He told me about it and said it was very good. I was living in New York at the time and he in Maine. So we both read it around the same time and were hooked on the full series. So, naturally, we were thrilled when the books were made into a television series by STARZ and that they have stayed very true to the original two novels thus far. After the series spent a brief time in France, they returned to Scotland in last night’s episode which was something we were really looking forward to. We missed those Scottish accents, beautiful landscapes & castles, and the dramatic atmosphere. It’s also a holiday weekend for us here in the states and as I was looking through meals to make this weekend, I ran across a scone recipe I had saved that’s from the Outlander Kitchen blog and book. I don’t have the book but found it on the blog, so I decided I wanted to make these scones to celebrate Jamie & Claire’s return to Scotland. The recipe is Fiona’s Cinnamon Scones which is actually from the third novel in the series, VOYAGER. It’s an easy recipe and one that featured a few techniques I was not familiar with, such as grating the butter, which I will definitely do in the future, and rolling and cutting the dough instead of simply cutting it into shape. The rolling threw me a bit because the scones in the photos are the typical triangle shape and mine didn’t turn out that way at all. It’s a very wet dough (at least mine was) so rolling it was a tad difficult as the “log” immediately fell flat, especially when I cut it. I made the dough, froze it, and baked it the following morning. They still looked a tad odd, but the warm cinnamon smell that consumed the kitchen was heavenly. I let them cool for 15 minutes, then drizzled the glaze, which pretty much dissolved into the scones. Now I needed to decide on which tea to have with them and which tea set and tray to use. I chose my Highland Beauty bone china from Dutchess China in England (est. 1881) and some Russian Caravan tea from Capital Teas. My Scottish Breakfast tea is only at work for the moment. And I chose one of my more “homey” trays with a lovely, country, kitchen scene on it. Some charming double, pink carnations rounded out the display. 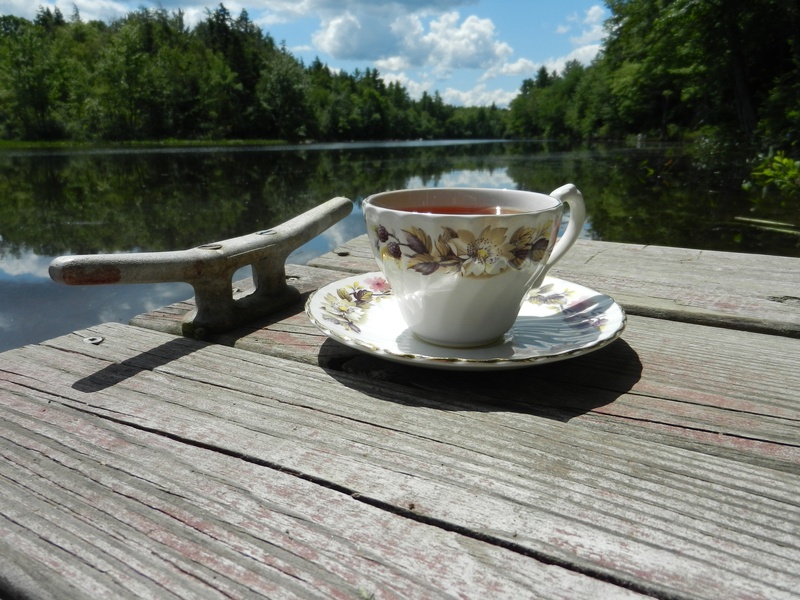 My setting for this tea was on top of the sea chest that belonged to my husband’s great-grand uncle Capt. Amond Lewis from the 1800’s. His initials are on the front of the chest and my husband also has a diary he kept at sea when he voyaged out of Bedford, MA. It’s wonderful see the captain’s real handwriting and read his words. He was born in 1848 and died in 1900. My husband’s middle name is also Lewis. The scones were basically some dough with a LOT of sugar, but oh, so good! The brown sugar-cinnamon coating rolled into the scones present a dark streak in the scone dough. The dough itself is flakey. Almost cake-like and certainly not heavy. I think grating the butter is the reason. It was wonderful. Then add the solid sugar drizzle on top and that adds yet another shot of sugar. YUM! Interesting story, and what a lovely display of beautiful flowers, tea set, and scrumptious-looking scones! YUM indeed!! Love ya! Thank you for the link…I`m glad you enjoyed the scones!